The modern and animated boathouse is not just a lodging space but an out and out entertainment center. There are playrooms, art galleries, a disco section, animation wall and of course a selection of quirky and vibrant suites. Luxurious, spacious and very vibrant, the Yellow Sub welcomes families, couples and solo travelers with equal warmth and vigor. Look beyond the generic beachside resorts and hillside cottages for an experience of a lifetime. Read on if you need any more reasons as to why you should be here. We all sleep in the yellow submarine! We’re not kidding, you actually can in the Yellow Sub in the UK. The refurbished 80-feet submarine vessel is now renovated into a stunning sunny yellow art centre moored in the city’s Albert Dock. Mr. Bubbles, the designer, and owner of the Yellow Submarine spent around nine months finding the right fixtures and 60s inspired fittings to make the floating hotel look as authentic and real as possible. The 80-feet vessel is anchored firmly on the banks of the Albert Dock and comes with a set of suites and various other entertainment sections that will keep you occupied during your stay here. The Yellow Sub is the kind of place that recreates the 60s in all its glory. The rooms are a kaleidoscope of images, colors,and experiences that will transport you to the sensational sixties. The shiny sunny yellow submarine looks like something straight out of an animated movie and stands out in its surroundings. Let us delve deeper into Pepperland and submerge in the land of yellow submarines. This beloved Beatles song came out in ‘69 and was soon the title track of an animated movie by the same name. The hotel is the brainchild of Alfie Bubble, an eccentric businessman, and an ardent Beatles fan. The narrowboat is converted to a yellow floating hotel, bearing a close resemblance to the Yellow Submarine on the cover of the Fab Fours iconic album of 1969. This funhouse lodging space has a lot of other interesting things up its sleeve. 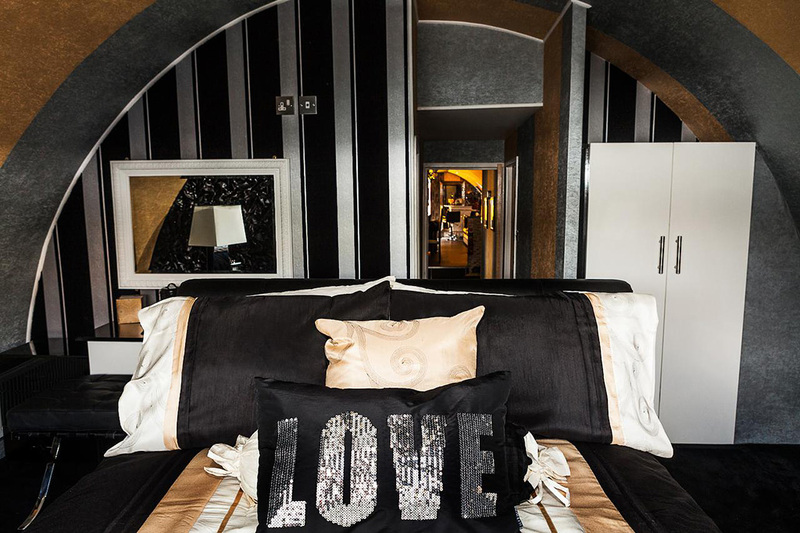 The quirky suites are peppered with pop-culture references from rock bands and celebs of the 60s. The whole experience is strangely psychedelic, paying homage to the surrealism and charm of the Beatles and their music. The boat that became the submarine was previously owned by Paramount Pictures and was featured in many thriller movies including the “The Hunt for Red October” starring Sean Connery. It was bought over by Mr. Bubbles, who runs Hollywood Limousines and plans on building a fleet of floating hotels including iconic vessels like Black Pearl and the Titanic. He came up with the idea after the success of his earlier vessel venture based on the Batman theme. The Yellow Sub can be spotted from a mile away, shinning merrily under the sun, floating freely in the waters and reminiscent of a time long gone. The boat earlier used as a prop for thriller movies was bought and converted into a boathouse by Mr. Alfie Bubbles. A team of dedicated architects and designers spent months trying to find the perfect fixtures to build the submarine and recreate the magic of the 60s. The classic shiny yellow paint and rainbow designs on the body of the boat put it in sharp contrast with the surroundings. Set against the backdrop of tall skyscrapers and dreary dockyard, the Yellow Sub shines out and yet seamlessly blends in the backdrop. It looks like something out of a cartoon or a storybook, that has found its place in the real world. The boat refurbished with metal and wood fittings are anchored firmly to the Albert Dock. On the outside, the vessel looks very compact with a narrow entrance, low ceilings, and small round windows. However, on the inside, the boat is pretty spacious and comfortable. The interior décor complements and enhances the vibrancy of the architecture. The lobby is tastefully decorated with plush leather sofas, comfy chairs, and blingy furnishings. A few of the pop culture relics and rock memorabilia are strewn across the room. 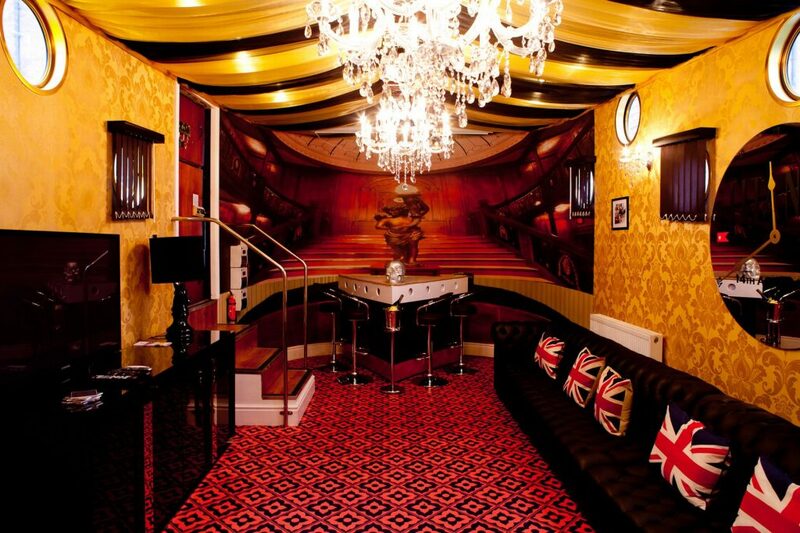 The sitting area comprises of a sofa lounge, Beatles gold discs, and a mob scooter from the iconic film Quadrophenia. The master bedroom is inspired by a suite in Burj Al Arab in Dubai. There are two other bedrooms adjacent to the master bedroom, both en-suite and with a private showering area. The huge windows provide a stunning view of the city’s skyline. Each of the rooms in the Yellow Sub has a TV, and customized furniture sourced from New York and Paris. You even get a small private kitchen space that comes with all the basic electronic equipment and a well-stocked larder. There’s a fridge, a microwave, a coffeemaker, a toaster, and gas hob. And if you don’t like cooking your own meals, you can head out to the public 6-seater dining space and bar that serves the best cocktails. Everything about the Yellow Sub is loud, bold and blingy. Each of the rooms seems to have a character of its own, with over-the-top furnishings that surprisingly don’t look out of place or vulgar. The Yellow Sub offers the complete vacationing package – music, dance, light, andcolors- you’d find all of it and more inside this vessel. The hotel focuses on providing a wholesome experience to families, catering especially to the needs of kids and The Beatles’ fans. The Yellow Sub Play Area, for instance, is a large section devoted to rides, bumps, slides and climbing frames. The football arena is for grown children, while the toddler play area keeps your little ones occupied. For adults, the suites are a treat to the senses. Other than that, there are theme parties organized every now and then in the events hall. You can even book the venue to host meetings and festivities with your near and dear ones. 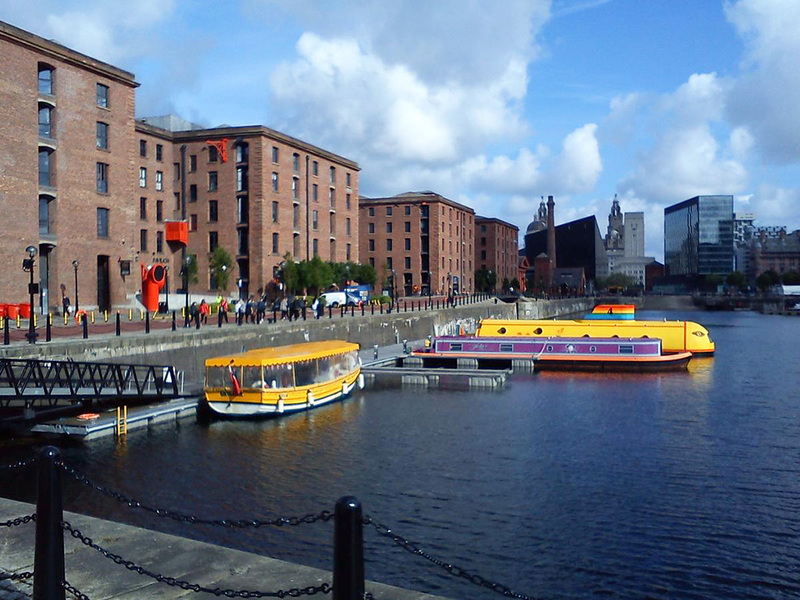 Once you are done exploring the hotel and its quirks, you can head out to the Albert Dock and The Beatles Story museum that is but a few minutes away. The Yellow Sub is set in the heart of Liverpool, near to possibly every major tourist attraction in the city. Other museums and art galleries in the neighborhood include the International Slavery Museum, Merseyside Maritime Museum and the Tate Modern Art Museum, all but a short drive away from the hotel. Finding a good hotel in the UK is not a big deal, the city of Liverpool is full of world-class accommodations and luxury resorts. However, for all their sophistication, none of them can beat the bliss of living and experience the recreation of your best childhood memories. The Yellow Sub in Liverpool is among the rare places that though not overtly luxurious and elegant, have the power to make you feel nostalgic and carefree. 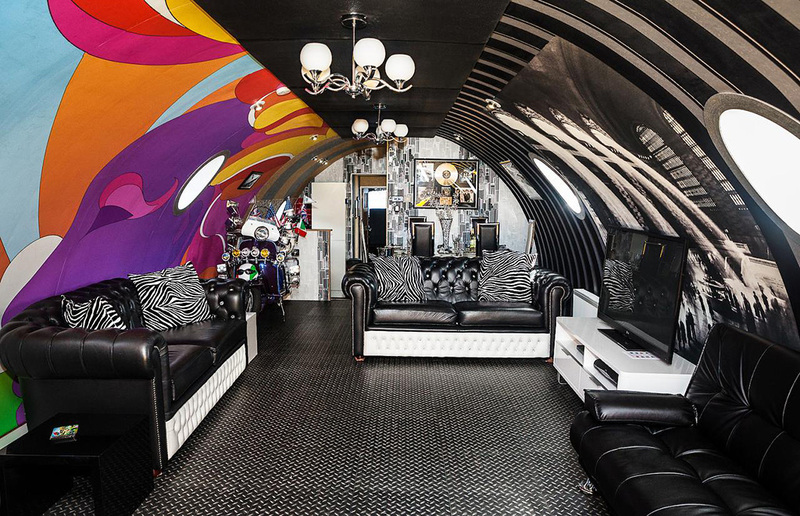 Imagine, getting an opportunity to stay inside the classic Yellow submarine that the Beatles talked about? Imagine waking up inside a sunny yellow sub, rocking you back and forth as you head out to Pepperland. Well the miniature model at Liverpool, UK comes close enough in making that dream a reality. The Yellow Sub in Liverpool, UK is the ultimate destination for any Beatles fan. So, hop in this bizarre boathouse and get back in time when the world was a much better and freer place, untouched by the corruption and chaos of modern society.